Our plan for the day was to go buy a Christmas tree. Since we moved to Kalamazoo, J and I have been getting real trees. It’s a tradition that I love. My family always had artificial trees growing up, but I love picking out a tree then smelling it for a month. The last couple of years, we’ve bought our trees from Badger Country Christmas Trees at their farm on Sprinkle Road in Portage. This year, for no reason other than to do something different, we headed out to Vicksburg to buy our tree from Mott Farms. Since we were heading that way anyway, I asked J if she was up for some good ol’ pub food. The Village Hide-A-Way is on Prairie Street in downtown Vicksburg. It’s very easy to spot. 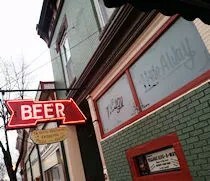 There’s an old neon sign hanging above the door with the word “Beer” inside an arrow pointing at the door. 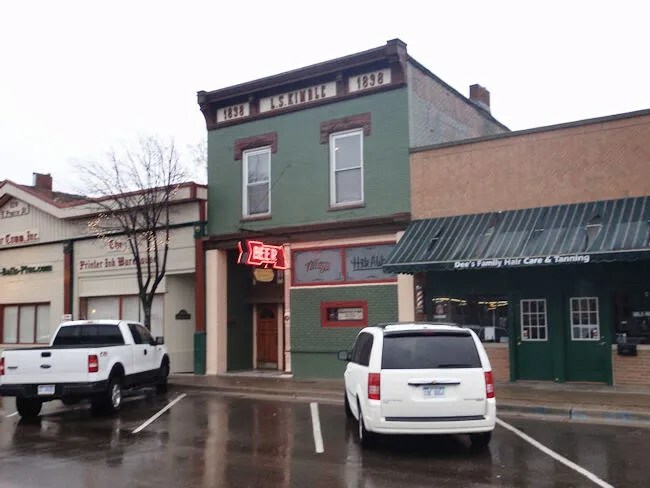 The building is an old two story brick row building with the name “L. S. Kimble” at the top with a date of 1838. The building has all the old charm of a building that’s over 150 years old. The old, creaky hardwood floor is littered with solid wood furniture. The brick walls are covered with sports memorabilia and autographed pictures. We walked in just before 1:00 on a Sunday afternoon. The plethora of TV’s were already tuned in to NFL football and college basketball. There were a couple groups already enjoying a couple cold ones and some greasy bar food. J and I took a seat at one of the many pub tables between the bar and the kitchen. The bartender grabbed a couple menus then got us a Sprite and a Coke while we looked over the larger than expected menu. Greasy burgers are kind of my thing so when I saw the Big Meat Burger on the menu, there was no way I could pass it up. The 1/2 burger served on Texas Toast is only the start for this one. 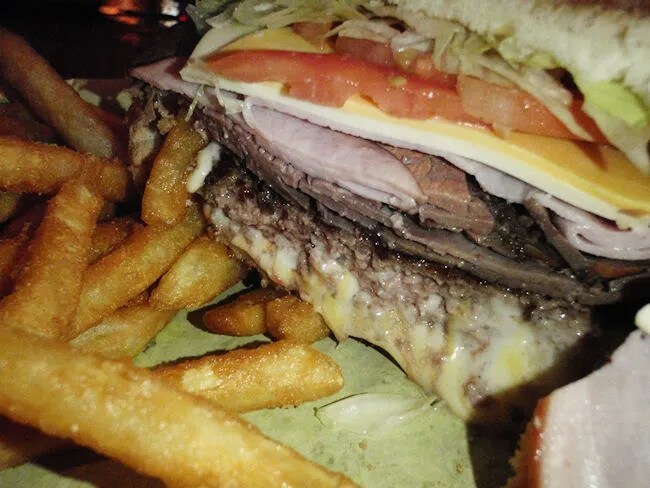 It also includes ham, roast beef, Swiss cheese, American cheese, lettuce, tomato and mayo. I, of course, left off the completely unnecessary mayo. This burger is so delicious it hurts. You would think that the taste of the beef would get lost, but it actually stands out on the sandwich. There’s kind of a hot/cold thing going on here. The ham and roast beef are cold so you get both sensations when you bite in to the Texas Toast. There’s cheese on both the top and bottom. The cheese on top stayed pretty much whole on top of the cold meat while the cheese on the bottom melted in to a gooey conglomeration of meat and cheese. It’s almost an afterthought now, but the sandwich came with a plate of crispy, golden brown fries. With a normal sandwich, I would have greedily ate these up, but I was so full after downing the sandwich, I only ate about half of them and begged the waitress to take the rest away so I would stop eating. For the second day in a row, J went with the Turkey Club Wrap. 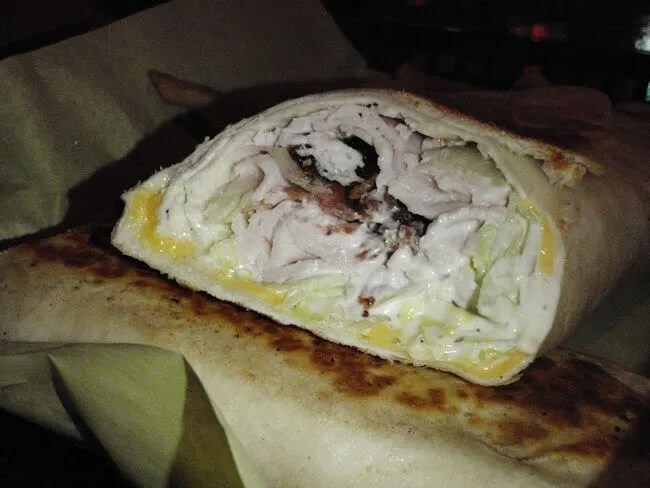 The smoked turkey is wrapped in a flour tortilla with bacon, American cheese, lettuce, tomato, and ranch dressing. What makes this wrap so much different is that the tortilla is pressed after it’s rolled. J loved this tiny detail. The tortilla had a slight crunch to it and it actually warmed up the whole wrap so she wasn’t eating just another cold meat sandwich. The thing was also huge. She ate “the small half” and still felt like it was twice what she was expecting. She said the wrap was delicious and was very happy to eat the second half for dinner. Our bill was right around $20 and for the amount of food we got, I’d have to say it was more than worth the price. The food was delicious. The Village Hide-A-Way is that kind of small town bar that I love. Great atmosphere. Solid food. It’s one of those community gathering places that takes a step up with good greasy food worth the drive.